DuoDERM is a well-known brand of ConvaTec that specializes in wound care dressings. It brings gentleness to the wound management and a peace of mind to the users. DuoDERM wound dressings are designed to speed up the process of wound healing by providing a moist environment to the targeted site. This is achieved by a unique hydrocolloid formulation that is incorporated into the DuoDERM dressings to create moist conditions under the dressing. The moisture-retention ability promotes epithelialization, allowing re-growth of skin over the wound bed. DuoDERM hydrocolloid dressings achieve this without maceration and patient trauma. At Health Products For You, we offer a wide assortment of DuoDERM wound dressings including DuoDerm Hydroactive Sterile Gel, DuoDERM Extra Thin Hydrocolloid Wound Dressing, DuoDERM CGF Hydrocolloid Wound Dressing, etc. How do DuoDERM Hydrocolloid Dressings work? DuoDERM skin dressings are required to be applied at the right time to increase the chances of quick and successful healing. On coming in contact with the moist wound surface, DuoDERM film forms a gel that creates a moist wound environment conducive to healing. Outer film offers a waterproof barrier to protect the wound and the dressing. Foam layer is known to provide both mechanical and thermal protection to the wound. Honeycomb matrix constituting of hydrocolloid particles is designed to absorb wound exudate and form a soft, moist gel. 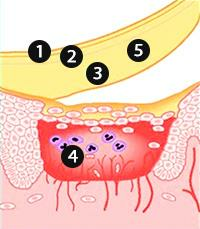 DuoDERM Convatec dressing keeps the nerve endings moist, thereby helping to provide relief from discomfort. DuoDERM wound dressing can be continuously worn for up to seven days unless it gets uncomfortable, there is leakage or there are some signs of infection. What is DuoDERM used for?